Rupert Murdoch's Fox News has again been caught misrepresenting video footage, claiming the anti-fees protests were a "rebellion against big government". Those who are familiar with Rupert Murdoch’s US news channel Fox News will notice that the conservative-leaning television channel often provides a right-wing outlook on current events. Whilst operating under the claim to be ‘fair and balanced’, accusations of Barack and Michelle Obama’s ‘terrorist fist bump’ and apocalyptic assessments of the President’s first 100 days in office seemed more like a propaganda movement than serious news. This approach has continued to the present day. 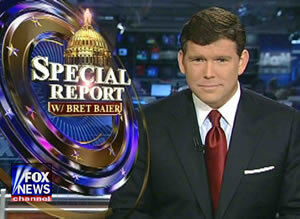 Whilst Americans have come to expect Fox’s style of news reporting, Friday’s edition of Fox News’s “Special Report” was particularly concerning. That was because this time they were talking about Britain. In a segment described as ‘Yankee Rebellion Resonates in Ye Olde England’, Fox reported that Great Britain is following the lead of the United States in embracing the ‘Tea Party’ ideology. There followed a series of soundbites from Matthew Sinclair, representing the TaxPayers’ Alliance. Whilst arguing the point that in fact the British people are increasingly for smaller government and cuts they use footage of a protest march to illustrate their point. It is only used for a matter of seconds, however if one examines the video the protesters are in fact marching against education cuts and increased tuition fees which arguably are a direct contrast to what Fox reported. The video handed the misrepresentation legitimacy, meaning the 99 per cent of viewers who would not have noticed what the banners and placards of the protesters actually said would have believed they were Tea Party activists. As well as addressing UKIP and the EDL – the latter described as a ‘nationalistic group upset about immigration’ – Fox issues a glowing report on the comparisons between the TaxPayers’ Alliance and its American counterparts. Whilst many might ask why this is of any relevance to British people it must be remembered Fox is the number one cable news channel in America, with millions of viewers watching every day for their dosage of what many consider real news. Clearly, this could have been a video error if there were currently thousands of people protesting in the streets of Westminster in favour of bigger public spending cuts, however this is not the case. Although Fox is the sister station of Sky News there is no evidence to suggest its British counterpart has been involved in the same ‘massaging’ of video footage. What it does suggest is that Fox should be not only more careful with their footage, but also more honest in their reporting. theres even a placard being waved in the student protest that has FOX on it…surely they werent upset about that and in return…naah. This error is clearly no worse than the BBC describing the marches as “anti-government”. As Chris admits, these were pro-government marches, wanting more spending and more, bigger government. You also didn’t seem to object when all the UK news channels, including Sky, described the violence as committed by a small minority or that it wasn’t officially sanctioned. Given the scale of the breaches of the peace and the involvement of NUS officials, that clearly wasn’t true either. So why pick on the Yanks?